Welcome to Week 1 of my Blogiversary Giveaway Celebration! 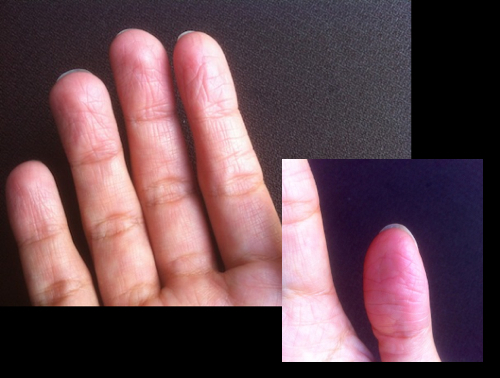 It’s not something I talk about very often (or ever), and it’s definitely not something I would’ve ever posted pictures of here on the blog, but over the past five years or so, I’ve developed a serious case of eczema on my fingertips. It flares up and then dies down depending on the weather, exposure to water, chemicals, etc., but it’s always there in varying degrees. I’ve tried everything and absolutely nothing worked. And I mean nothing! I’d just about given up, until I started hearing about this hard lotion from some of the blogs I follow. After a little research, I figured what the heck, and decided to contact the owner/creator, Renee, who so graciously sent me a wonderful gift pack of her Bee Silk recipe. I wasn’t expecting much, and even Renee told me not to expect a cure, but at that point, I was willing to try anything. Long story short: MadeOn hard lotion has changed my life! MadeOn hard lotion is just that: a hard lotion bar. It’s solid at room temperature and melts as it comes into contact with your skin, coating it with a silky soft, nourishing layer of shea butter, coconut oil, and beeswax. That’s it! 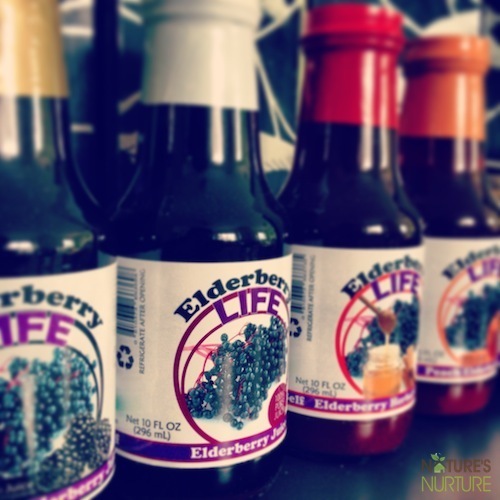 Just 3 simple, natural ingredients. Hard lotion is better because it uses beeswax to leave a gentle, protective coating on the skin. 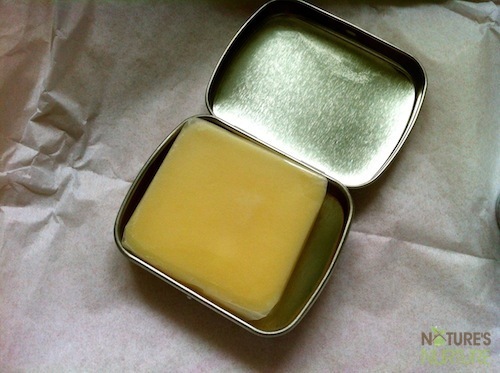 The beeswax works to seal in the ingredients for longer-lasting absorption. No water necessary. Hard lotion is for those with cracked skin, split heels, alligator legs or rough elbows who have been frustrated with the lack of effectiveness of off-the-shelf lotions. It’s also for those who are concerned about the excessive use of steroids to control their skin problems and are looking for natural relief. It’s for both men and women who appreciate applying lotion that doesn’t leave the skin feeling greasy or sticky. Check out the video below to hear Renee explain exactly what the hard lotion is, how to use it, and why it’s the best! Renee sent me 3 products from her Bee Silk line to review: a family sized lotion bar, a travel sized lotion bar, and a lip balm. As soon as the package arrived in the mail, I snapped a few photos and dove right in! I tried the lotion right away and immediately, I felt the difference between hard lotion and the creamy lotion you find at the store. It does take some getting used to as you figure out your routine, but it’s so worth it! I used it regularly throughout the day, and especially after I washed my hands, since water and soap are the biggest enemies for my dry, cracked fingertips. After 2 days, I already noticed a difference. My husband used it as well, on a stubborn dry spot on one of his knuckles, and for someone who rarely gets enthusiastic about things like this, he kept raving about how well it was working for him! In one word, he described it as “healing,” and I totally agree. After about a month of using the lotion, my fingertips are all smooth, with no flakey, scratchy nastiness LOL. 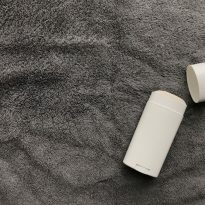 I can actually pat my toddler’s head and face without feeling like I’m scratching his skin with my fingertips – I am beyond happy with your lotion! Alright, alright, enough with all the talking – where are the pictures already? I wouldn’t normally publicly share pictures of my hands for the whole world to see, but this lotion is so healing and nourishing, I’ve decided to share some before/after shots with you. The before shot was from a few months ago and shows just how bad my fingertips would get. 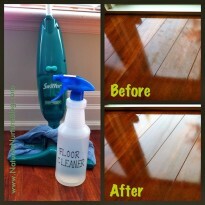 The after shot was taken just this morning, and the difference is unbelievable! I also tried the lip balm a few times and loved it! We’ve been visiting family in (hot and wet) Florida for the past few weeks, so I haven’t really had a need for it. But I do get dry, chapped lips in the winter, so when we get back to Toronto next month, I know I’ll be slathering that lip balm on all winter long! 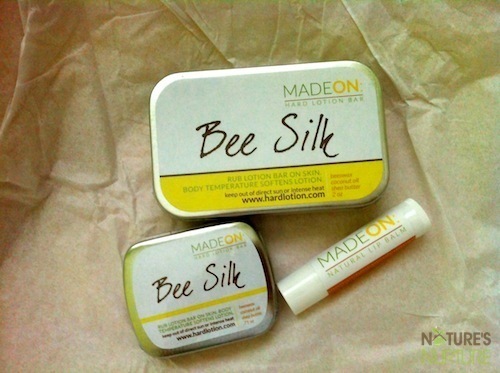 The MadeOn skin care line is more than just hard lotion and lip balm – Renee also makes hair butter, diaper rash cream, insect repellant, and even a junior line for more delicate skin. 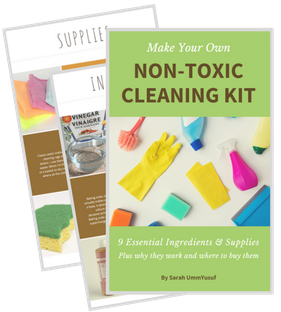 She also has a couple of eBooks each with 5 different recipes for making your own products at home. 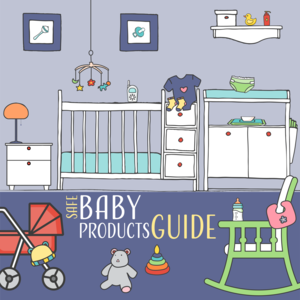 The Safe Baby Products Guide is Here! 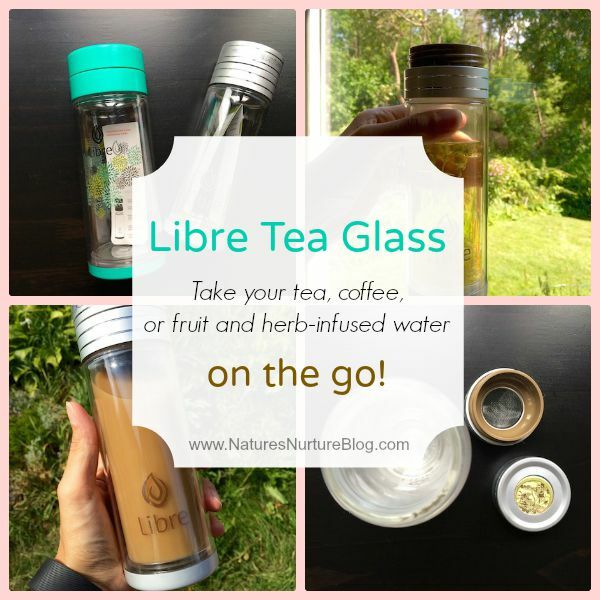 Libre Tea Glass – Take Your Tea On the Go! i’d love to try this for the winter… my hands are always cracking! my dad has the same problem, so it could be something to get him as well! 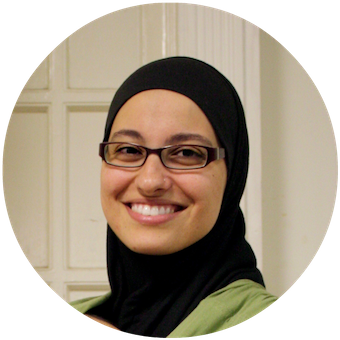 love the blog and the helpful posts that pop up on my fb newsfeed, thanks! These products look wonderful. Would love to win!!! I would love to try this product because my hands get very dry in the winter. 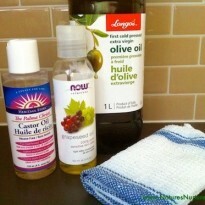 I have a difficult time finding a product that works well to battle the dry cracking skin. This stuff sounds great! I make my own lotion with the same ingredients, but it’s not hard. Guess I need to add more beeswax, but I’d love to try their version. 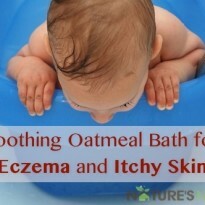 I have very dry, cracked skin, especially while I’m pregnant, so this would be great! My hands are so dry all winter long! It gets so bad that they crack and bleed. I would love to try this product! I have tried so many different lotions and nothing seems to work well. I dislike the greasy feel of some lotions. In the winter my thumbs get so dry that they crack and bleed so I think I will have to try MadeOn Skin Care Hard lotion this year. Ughh, I hate that greasy feeling too, Teri. 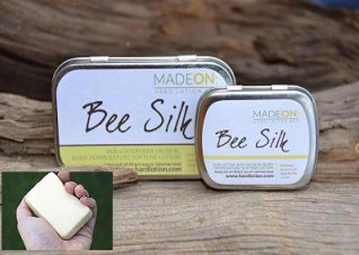 That’s why I love MadeOne – it starts out greasy, but as it absorbs into your skin, you barely notice it’s even there anymore and makes your hands so silky smooth. I know all about those dry, cracked, and bleeding fingers… Good luck! LOL @ crack cream! I totally agree! And yes, Renee is just awesome! Thanks for the kind words, Cindee and hope you win! I am looking forward to trying this instead of regular lotion. I’ve recently become a fan of Renee’s hard lotion & I’m trying to convince my husband to try it. He has an inherited skin condition on his hands & feet, as does my 17 year old son. I would love to win the gift pack for them to try. Aww, that’s sweet Dixie 😉 Good luck and hope you win for your hubby and son! What a nice giveaway! With winter coming, I dread my hands drying, cracking and bleeding. The Hard lotion would help with my dry hands and dry-cracked heels (that nothing seems to help). 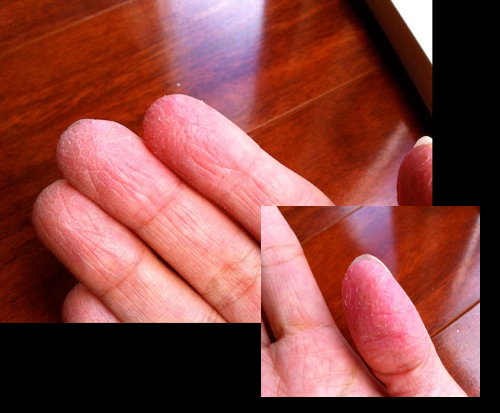 I have Raynauds, a circulatory disease. It would be so nice to massage my fingers and toes with the Hard Lotion. Thank you for the opportunity to participate. I would definitely need this now that it’s starting to get colder because my hands become very dry! Ahh, the little clear blisters!! Yes, I totally know all about them lol, and I’m happy to say that they’re also gone too! 🙂 Good luck, Ashley! I have very dry skin and suffer from keratosis pilaris and would love to try a natural alternative to help my symptoms. During the winter months my sons hands crack and bleed they get so bad. Most lotions only make it worse. I would really like to try this! Ooh, I used to have eczema on the backs of my hands which wouldn’t quit. It also flared up depending on weather or things I got on it. 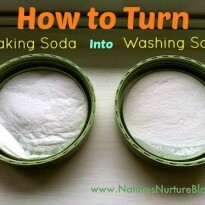 I have actually figured out the root cause though, the laundry powder my mother uses was causing it. Hard to figure out, because she’s always used it and I’d never had issues before, but they’ve changed the formula or something. I only worked it out because I lived away for a year and as soon as I came home the eczema came back. So now I don’t touch it, at all. Even hanging out her wet clothes, the residue is enough to affect me. I do have a fiance with ridiculously dry hands and feet though, and while mine are usually ok it’s only because I’m careful to always wear gloves for dishes and cleaning. I know how quickly they dry out if I don’t! I tried MadeOn lotion last winter and loved it. Now that cold weather is back and my fingers are cracking again I’ve been thinking it’s time to buy some more. But I’d much rather win some! Thanks! I have wanted to try hard lotion for a while but haven’t done it yet. This stuff is truly amazing, isn’t it? Definitely take advantage of that coupon code! Winter is fast approaching and my hands get so dry in the winter! Congratulations on your one year anniversary! Thanks Nancy! Good luck and thanks for entering! I need to win because I have the driest feet in the world (I am pretty sure I would qualify for a world record if there were one). I have tried MadeOn Lotion before(and loved it) but not on my feet. If I don’t win, I guess I need to buy some more 🙂 Thanks for doing this giveaway. I have never used a hard lotion and would love to try this! Everything looks amazing! I would love to try this product for a few reasons. Being a CNA my hands are so dry, cracked peel and are split from the constant hand washing and sanitizing gel that we use. I work in the OB surgical wing and i need to have soft hands to handle the newborns because their skin is so frail. The other reason is my husband. He likes to rub my back and arms but his hands are so rough that they feel like sandpaper and to be honest it is not very romantic! The other reason is his feet. They are so dry and peel and crack. I have had to file his heels about every other day and have had to use sandpaper. I would love to see if your products are the miracle we have been looking for! Thank You for consider me. Aww your comment made me smile, Tammy 🙂 I hope you win too! Thanks for entering and good luck! I love MadeOn Lotion. I too use it after washing my hands it really keeps them smooth. I’ve recently developed some eczema on one of my fingers-it runs in my family so I’m not shocked. I would love to see if this lotion can help me out as it’s helped you!